The voyage on the Honig Konig will mostly be remembered for the children. They filled the days with noise and fun, singing and constant questions I did not understand as my German is nowhere near the standard of a four-year-old and nearer that of an 18 month old baby. Two boys and a girl (who was the oldest), 8, 6, 4 years old, where on their school holidays and were full of energy and had very loud voices. 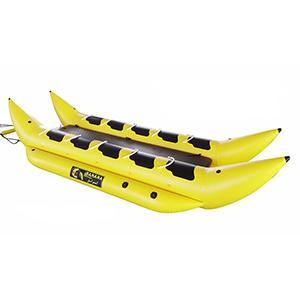 At one point, when we were approaching the longest aqueduct on the whole canal system, I stood up to arrange my camera ready to film the view, I noticed a bright yellow object about three hundred meters to the stern, something that looked just like the Banana. 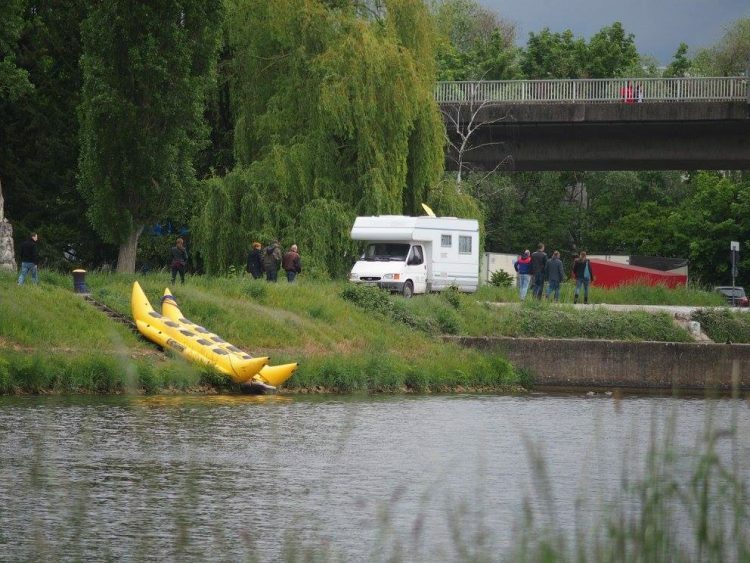 When informed, the captain agreed it was the Banana and a rescue operation was put into action. The ship was put into reverse and the crew came up to use long boat hooks to trap the freed fruit from the foam. (I like alliteration). On examination of the tow rope, it was clear that the way the ropes had been bound was not adequate. They were not spliced together but were simply folded onto each other to form a loop and held in place with a plastic sleeve. This arrangement had slowly slipped little by little through the sleeve until they let the Banana go. Fortunately, we were on a canal and not on the flowing river, and also as luck would have it the trailing ropes did not get tangled in the propellers. Repairs were hastily made and we set off for the next lock, Banana in tow once again. At the lock more repairs were made and a stranded toad was rescued at the same time! I documented the voyage in my little note pad and on film, the journey was filled with superlatives. The longest, the highest, the deepest all applied to the canal and its locks and aqueducts. We sailed calmly past the international watershed concrete marker and made the transition from the Rhine catchment area to the Danube river system. To get there we had been lifted up in the deepest lock on the route; a 28m concrete cavern with a slit of sky above and steel vault like portcullis style vertical sliding doors. We arrived in Regensburg in the afternoon; there was time for me to have a light meal with the family before leaving the ship. The captain had radioed in to tell the lock control I had arrived with the Banana. I asked him not to do this, but he felt he had to. I heard the conversation and picked out the phrase “the problem is”. There is always a problem. The crew followed the lock keeper’s instructions and hoisted the Banana onto the bank, above the lock and away from where I would be able to get a lift. The motor home was brought into range and I parked it on the tow path, 20m from the Banana and waited for the police to come. There is a huge fairground on the opposite bank of the river, and the town is full of motorhomes and caravans belonging to the fairground people; the police have not yet come and must think that I am with them. The Banana is very badly positioned, so I am taking time to make some repairs, catch up with writing and have some fun, including filming a scene of a play with an amateur dramatics actress called Christina, and getting involved in a beer fest extravaganza in a vast tent with thousands of young people drinking 2.5kg 1 litre glasses of beer and dancing on tables. One has to suffer for one’s art. Thurday night, 20th May I had to stay near the Banana as the crowds passed on their way to the fun fair. I watched from about 50m away as most people just walked by, but a fair number took interest, wondering why it was there. It supprised me how many people and young children with their parents took the time to kick the Banana, give it a push or try to climb on it. The steep angle of the bank prevented most people from doing this, but those who did risked slipping or falling into the canal by rolling down the length of the Banana. I had put the Go Banana flag onto the steel mooring post. This seemed to be an irritable temptation to give it a tug on the way past. Eventually someone pulled it over so it blocked the path and I had to remove it. I spent the evening surveying the antics of people, and went to bed only when the crowds passing had dwindled to the last remaining few drunks who were fully preoccupied to trying to walk in a more or less straight line to find their way home. I was up early to be available should any ship happen to make a brief stop to do some shopping before going through the lock. There was nothing moving on the canal other than two passenger cruisers and on cargo ship, all of which went straight into the lock, not even starting to slow until they passed me. Sailing in mid channel there was no chance even to shout a conversation with the crew. I decided to write up the blog and find somewhere to use the internet. I eventually found a shopping center with a small MacDonald’s but could not enter the multi-level carpark and had to drive around to find a parking. I had a burger and chips, a carton of quite nice coffee and set to work answering 49 emails and then got onto my Facebook page to load photographs and then have a look at the Go Banana website. I ran out of time and had not loaded up the blog… not good. I did not notice the three hours go by so quickly. I returned to the quay side and decided to go into the old town. I would have to think of another solution to the bad position of the Banana and see if I could find another route to get a lift. Walking through the old quarter and along all the various banks of the Danube, channels and tributaries that meet in Regensburg, I discovered that the quaysides are used almost entirely for the tourist trade. I had some encounters with local people along the way which I filmed, and eventually saw a small marina upstream on the Danube. I was warmly welcomed by a group of sailors who had moored their boats to have a sort of picnic in the sister marina to the main marina 5km further up stream. I returned to the motorhome to find a deserted ship moored under the bridege, with its wheel house just 10m away; and an ant like procession of people, many dressed in local costume, heading for the fair. I set up a chair, got myself a bottle of local white wine from the fridge and settled down to protecting the Banana. The fairground closed at 11.30 and those who could still walk headed back. It was surprising how many drunk people thought it was fun to bang on the motorhome to wake up anyone sleeping inside. Those who did this had a very bright torch suddenly flashed into their eyes at close quarters and were bombarded with loud universal language even a drunk could understand. I made the 20m trip between the Banana and motorhome until 1am when I was satisfied the remnant were incapable of doing any damage. Apparently no one had returned to the nearby ship, so I kept looking to try to catch the captain to ask for a lift for whenever the ship was sailing. Around 11pm I noticed a light on in the accommodation but did not want to disturb or anoy someone who could offer a lift. I decided to leave it until the moring. Bed at 1.30 and up at first light; a dim grey to the east at 3.50am. I packed ready to go, and untied the Banana (it had a complicated system of ropes to make it difficult for a drunk to mess around with it). I put the long rope in position so that the Banana could be pulled off the bank and towards the ship in a few seconds. Then I stood and watched the sun come up and the shadows from the bridge shorten. No sign of movement until 11am. I had had a good look at the ship whilst waiting. It was untidy and unloved. Bits of rope, old tools and signs of bad repairs where everywhere. It was an old ship and still had a wheel in the wheel house, the first I had seen. The accommodation was poor and the paint work showed that the constant maintenance I had seen on other ships really is needed. A large round over fed man in a failing Tshirt appeared with a wheelie shopping bag and I immediately went aboard to ask for a lift. He was not the owner of the ship and could not ask his boss for permission to bring someone on board. He did not speak English so I used my waving hands and extremely poor German, his second language, to get my message across. He was not sailing until Monday morning which was not good news as the quay was now completely blocked by his ship and another which was moored during the previous night and which was westward bound. I went to get some sleep and try to formulate another plan. The “Plan” was to walk over the bridge, get a Vietnamese meal and go to the marina the go back to the motorhome and move the Banana to the quay before the crowds come for the Saturday night fever at the carnival over the bridge. All accomplished, except the marina was closed, I returned to find the motorhome gone. Off to the police station on the other side of the river to be told it had been towed away. There was a 30 euro fine to pay plus 181 euros for the tow truck company. I had a long a friendly conversation with the desk officer who really liked the Banana project. He said I could have phoned for special permission to leave the motorhome where it was because it was not in anyone’s way. He gave me the telephone number and told me to phone on Monday. After handshakes and smiles all around, I left, following his instructions to find the motorhome parked in the pickup center. A grubby looking aggressive German greeted me with the snarled a command to move the motorhome within two minutes, or he would phone the police. I don’t take too kindly to threats so told him to phone and I will wait. He was more than rude, aggressive, threatening and has made very good television. His two minute rule is not enforceable and I will send the clip to the town hall, the police commissariat and the tourist board. After the confrontation on camera I moved the motorhome to block the gates whilst I went to have a private word with him. I won’t put here what happened but it turns out his employees are cowards and the loud mouth is a wimp. I went to find some docks I had seen from a bridge and found them, complete with cargo barges and all the trimmings of a busy port. One accessories surprised me. Onh top of a pile of sands 15m high was a woman in full wedding dress, jumping up and down and generally larking about whilst a photographer took pictures and the husband looked on. It appears it is a local tradition that after one year of marriage the wedding clothes are destroyed, hers were being ‘stressed’ for the camera before the finale; the wife is thrown into the Danube wedding dress and all. I filmed a lot of the proceedings, so today is a good television day, although the Banana has not moved at all. Randomly went banana today as we bumped into the crew on our way to the fair. Very refreshing to meet someone on a rather unconventional journey, but it is sad to hear how many fellow Regensburgers know no better than getting drunk and bothering banana travellers. Hopefully the many beautiful things this town has to offer will be remembered just as much. Needless to say this fruit is going to have countless stories to tell, with the longer part of the way still ahead. Enjoy the ride!